In an unexpected finding, theta oscillations were most prominent in a blind person who relied on a cane to move. The scientists hypothesized that a sightless person explores a strange environment through multiple senses, which would require more brain activity to process the extra sensory input. Theta oscillations are one of several types of rhythmic waves in the brain that move, or oscillate, at different frequencies. 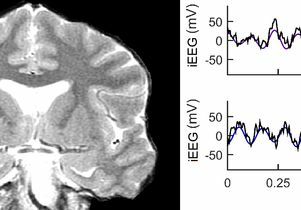 Theta oscillations, which occur deep inside the brain, are named after the eighth letter in the Greek alphabet because they move up and down eight times per second. Scientists have long suspected that theta oscillations support our ability to learn new places and encode new memories, but no one had previously been able to test the hypothesis in humans. The region responsible for regulating spatial navigation lies deep inside the brain. The inaccessible location has limited previous studies on the subject to rats or to people who were asked not to move because researchers needed them to be connected to hospital equipment. The study was the first to use a wireless implant to directly record brain waves in real time as people moved freely through an environment. Researchers analyzed four volunteers who previously had small wireless devices surgically implanted in their brains to prevent seizures. Dressed in motion-capture suits, the volunteers walked at different speeds in a large room as the implants recorded their theta oscillations. The UCLA team tracked the volunteers’ movements and later correlated them to their deep brain waves. The ability to navigate the world around us is a crucial part of daily life, and the study sheds light on the relationship of theta oscillations to human learning, memory and exploration. In addition, forgetting the route home is also one of the first clues of early Alzheimer’s disease, and the new findings could help inform future studies and the development of new therapies for patients with memory disorders like Alzheimer’s. The study’s authors include Nanthia Suthana, assistant professor of neurosurgery and psychiatry at the David Geffen School of Medicine at UCLA, and Zahra Aghajan, a UCLA postdoctoral scholar in psychiatry. Both are available for interviews. The research is published in the Nov. 30 issue of Current Biology. The Defense Advanced Research Projects Agency, the National Institute of Neurological Disorders and Stroke, and the A.P. Giannini Foundation supported the research.